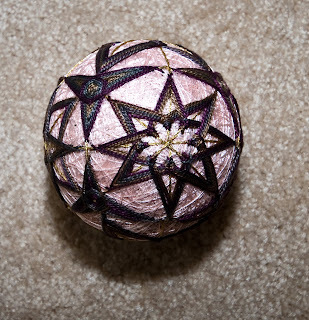 This is the other temari I finished. It's a bit more elaborate and I also used Valdani perle 8 on it, this time a brown variegated. 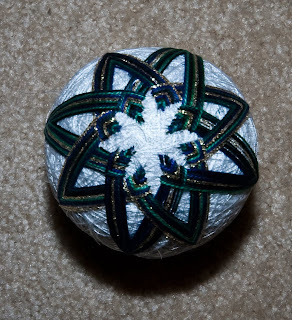 It's also got the polyester thread base, which was still slippery. Both of these will be given in June, just before my friend leaves Kosovo for good. I just had to finish them before I left so I didn't have to mail them. 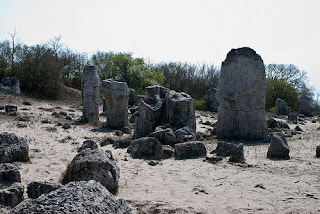 About ten miles west of Varna, just off the highway back to Sofia, there's a natural geological formation. We visited it, and here are some pictures. 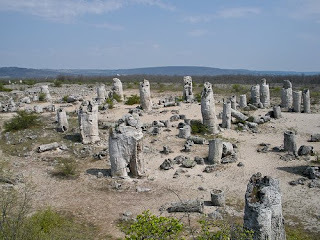 It's the Stone Forest, and it's a national heritage spot in Bulgaria. Even though there's sand underfoot in these pictures, the surrounding area is tree-dotted meadow. The "forest" runs about three kilometers by half a kilometer and a road straddles it. 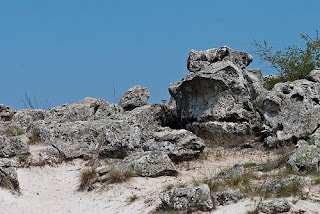 They say these rock formations were made just like stalactites and stalagmites and then the cave just fell in and eroded around them while they stayed in place. The guide/money collector (entrance was less than two euros each) gave us a New Age spiel about the energy of the rocks and their spiritual healing power. Needless to say, we didn't fall for that. We did, however, take lots of pictures of lizards and flowers. Those aren't on flickr yet, though. Anyway, if you get to the Varna area, do visit. It's impressive. My host is leaving Kosovo in July, and he needs to give gifts to his local employees. I offered to make temaris. This past week, I finished two! Here's the first. I made large interlaced kikus at the poles. 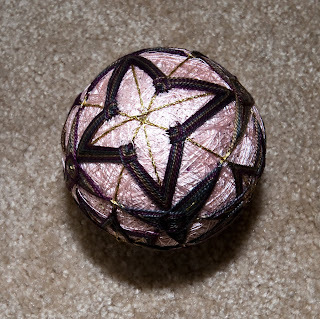 The ball is shiny because I used polyester thread to wind it. I -don't- recommend this unless you have a lot of patience for slippage. 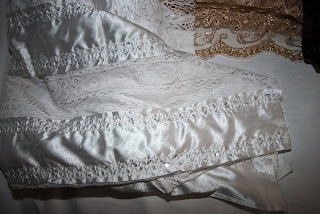 The stitching is with a Valdani perle 8 and Petite Treasure Braid. Considering, I think it came out pretty well. The locals don't have any kind of tradition like this, so we're hoping they'll like it more due to the novelty factor. The smaller balls are all perle cotton. They were about a euro each. I really like the colors, but haven't used them yet. The second half is begun. Now I get to do strips the other way, in green and ivories. At least it'll be done soon. 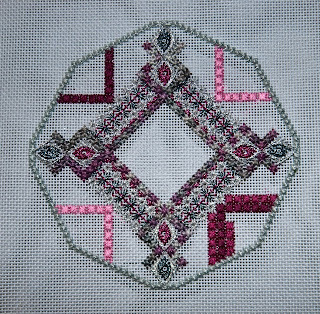 I made progress on the measles/wild cherries project this week. The top is done but for the outer line of simple stitches. 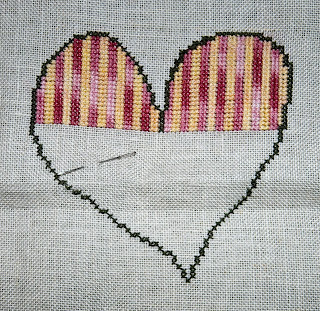 Still, though, I've been so busy with other things I haven't been able to stitch much. I'd hoped to finish this before I left, but it looks like I'll finish it back in the States, since I leave on Wednesday. I found a needlework shop in Plovdiv! It had cross stitch supplies and a whole bunch of trims, walls of them. The prices were mismarked, so I didn't buy as much as I should have. This is what I did buy, though. A meter of each - and the total cost under ten euros! Yay, I finally finished part six this week. I've already got part seven, but won't be starting it until I finish the heart. This only has three more pieces to go and it's done. 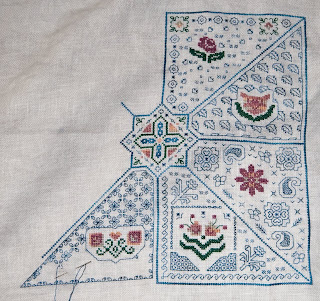 The next part isn't nearly as dense with blackwork, so it should go more quickly. 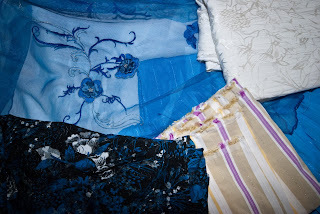 I bought a -lot- of fabric in Plovdiv. This set of pictures is the result of my second shop's raiding. 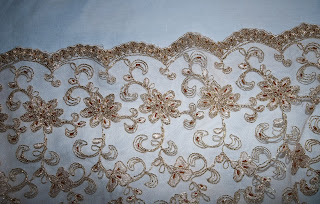 Most of the laces are beaded. 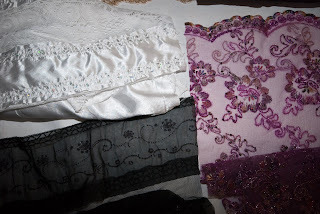 This shop had a lot of really nice lace at a very reasonable price, so I stocked up. I thought the white was interesting with the lace inserts. The gold is heavily beaded and the flowers are beautiful. 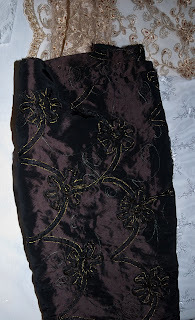 This black didn't turn out well in the photo, but it's taffeta with gold-edged taffeta ribbon roses on it. Looks really nice. 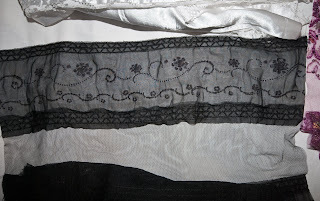 Had to put this lace on black so you can see it. It's gorgeous. 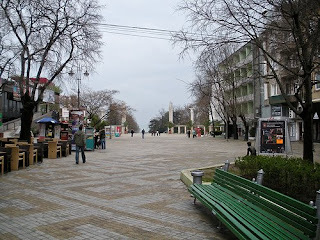 Here are my last pictures of Varna. 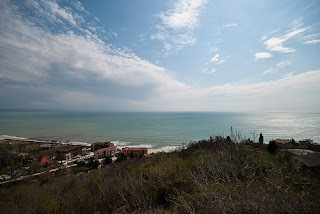 This top picture was taken from a hilltop just outside Golden Sands, north of Varna on the coast. Golden Sands is a very crowded all inclusive place. The sea looks better in this picture than on previous days, though. 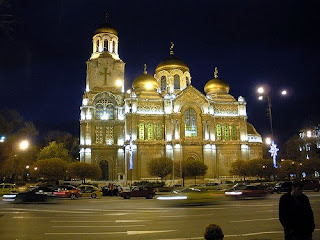 Here's the Cathedral of the Assumption. Our hotel in Varna was just behind it. It's very pretty inside, but I like the way it looks lit up outside at night better. 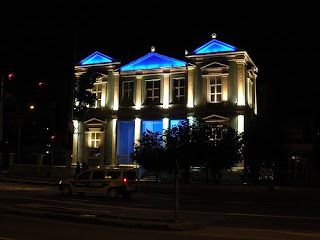 And this interesting building houses the Bulgarian Navy Band. It's a light blue in the day, but they really make a show of it at night. 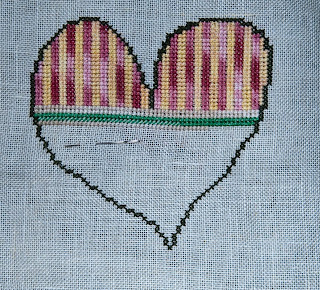 While in Bulgaria, I managed to get the top half of this heart done. I hope to have the rest finished just after I get back to the US. The bottom half is cream and green stripes, horizontal. I managed to work on this a little bit in Sofia. It's something, at least. I'm feeling stitching pressure because I've gotten so little done this month. At least I got the major crazy quilting block done that I needed to, but still... I guess next month at home I can catch up some. So - Monday we had to go to the grocery store after getting home from Bulgaria on Sunday. As we were driving down the road where the store is, something small came running toward us. We stopped, and it kept coming closer. I got out of the car and ... this cute little puppy bounded to my feet. I couldn't resist picking her up. She's between three and four weeks old and we're transitioning her to solid food. Never touched by a human until Monday most likely, she's decided she loves people. Very sweet disposition and she'll grow to about the size of my Mattie the Magnificent. That's why I can't take her home. 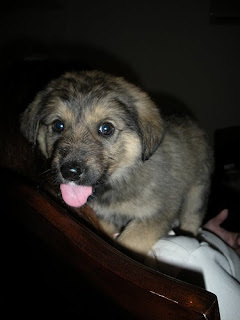 I already have three dogs, including one Sharr. I've been forbidden! She's with us until someone wants her or we go to Decani on Sunday. The monks there are looking for more Sharrs to act as guard dogs. Anyone want her? We passed a news stand in Plovdiv and the lady running it had three! magazines out with needle crafts. Needless to say, I bought all three. Two are cross stitch magazines and the other is crochet. 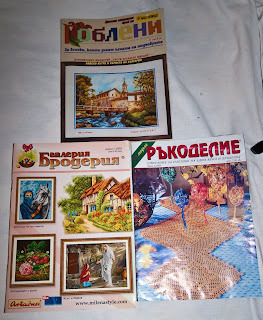 Everything's in Bulgarian, of course, but the cross stitch magazines have Anchor, DMC and Adria ( a brand from Poland) colors. One of the magazines even has color charts! I'll have to stitch some of these things. 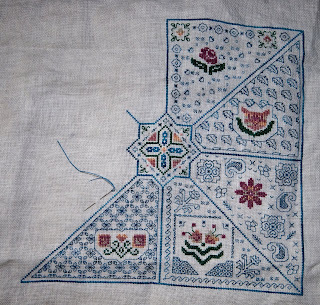 While in Bulgaria, for some reason I did a lot less stitching. 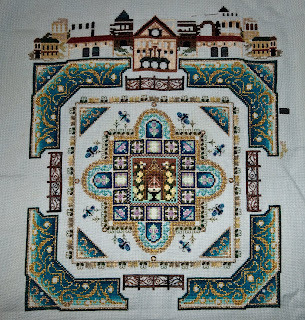 Even though I'm back in Kosovo, my stitching time hasn't increased much. 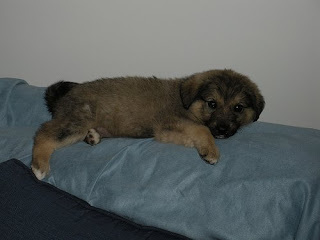 We rescued a puppy on Monday and I've been dealing with her. She'll be a separate blog post tomorrow. Anyway... I have been working on my spring mystery and am finally almost done with part six. I'm sooo behind on all these. 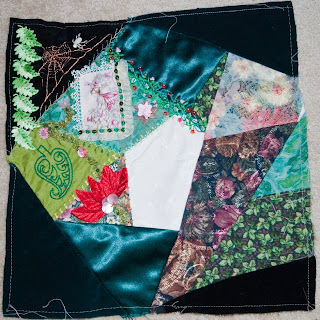 This is Melisa's block from one of my crazy quilt round robins before I did anything. 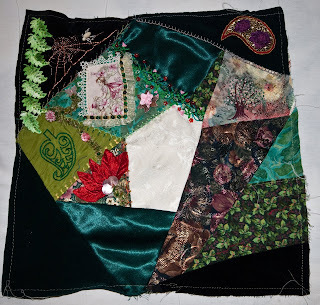 It was hard for me to figure out what to do, since this block and its embellishment so far is just not my style. I finally decided to do two motifs. Both have been done in my time in Kosovo and Bulgaria. 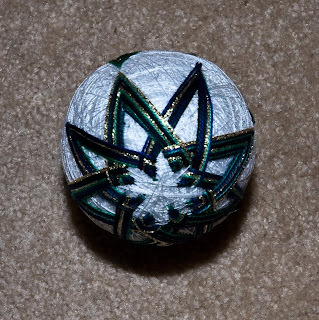 I also did the silver bead seam between them. This is the overall block after my work. 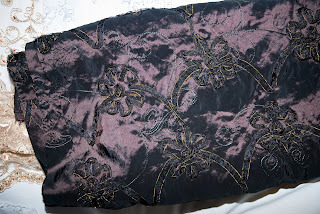 I spent about eight hours stitching this paisley. 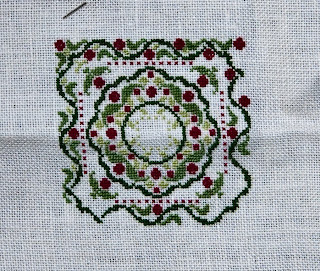 It's got two huge stem stitch roses, lots of bugle beads, and six rows of chain stitch. I think it came out pretty well. And here is the tree I made below it. 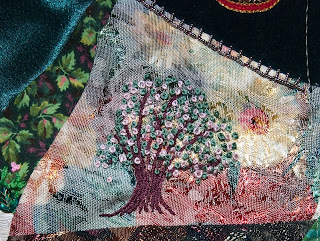 The trunk and branches are outline stitch and the leaves and flowers are French knots. It took me a few hours to do this, too, but I like the effect on the print. It almost looks like dawn behind it. 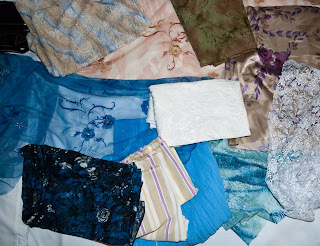 Okay, so I went a little bit crazy with fabric buying in Plovdiv. But we found LOTS of fabric stores! 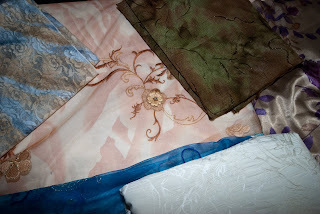 This is the set of fabric I bought from the first fabric store - and it was very reasonably priced. 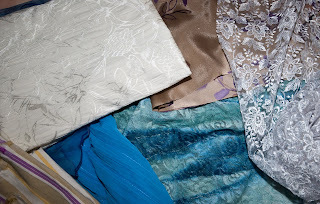 Most of the fabrics were under 3 euros/meter. 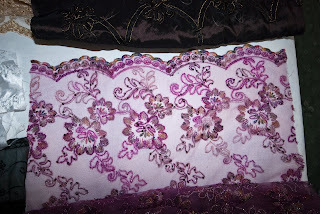 These next pictures are all close ups of the fabrics. 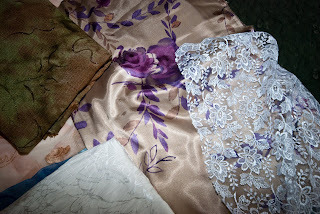 The blue and peach florals are going to be great for motifs; some of the flowers are three dimensional. 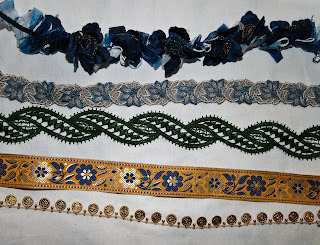 Three stretch laces are also here - all of them under 2 euros/meter. I also liked the overall lace floral in the upper left here. I think it'll make a great store of motifs. 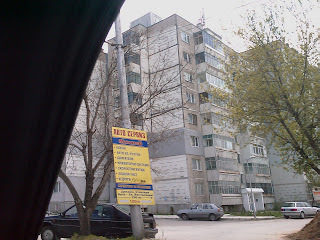 When you first drive in to any Bulgarian city, you see row upon row of high rise apartment blocks. Sofia has them. Plovdiv has them, but not nearly as many. And Varna has several miles of them. 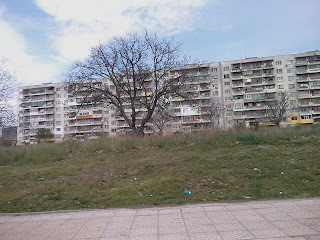 They were built during the communist era, and you can see from these pictures taken with my camera phone from the car how dilapidated they look. For large numbers of Bulgarians, this is a step up from the rural huts of the villages. All of the cities are in the process of building new, better housing. It's needed. I thought it was important to show these and not just the pretty places. We drove home to Pristina yesterday. I'll be here just over another week before returning to the States. This past week, I worked on Camelot some again. 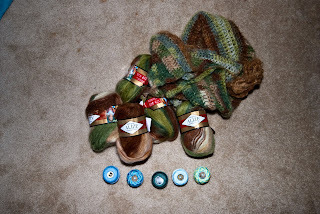 It's been all scotch stitch. I'm thinking of doing this pattern again, but in blues. I really like the diamond design in it. 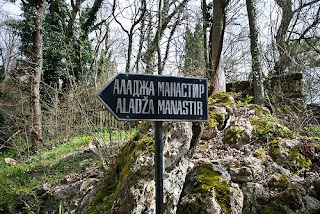 We drove outside Varna on our second day there and stumbled upon a monastery. We decided to visit, thinking it'd be a collection of buildings. Needless to say, it wasn't. 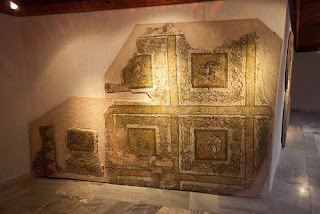 This first picture is a bit of mural that was taken off the monastery wall during its rediscovery. 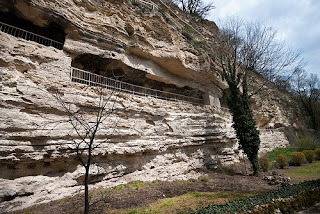 The place is called Aladzha; it's north of Varna and south of Golden Sands, about a mile from the coast. You can see it's all wild around it from this picture. In fact, it's in the middle of a nature reserve. And here is the monastery itself. Yep, it was carved into the hillside in the 13th and 14th centuries. Despite my fear of heights, I went all the way to the top. 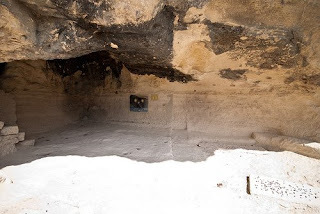 This was one of the monastery's bigger chambers - the refectory. Yes, the ceiling's that low and yes, it's open to the air. 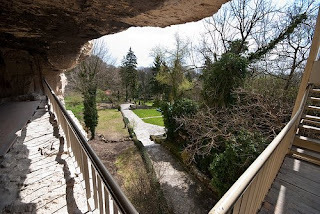 And here's a picture out from about halfway up the monastery. Really pretty parkland surrounds it and it'd be a pleasant place for a picnic. Unfortunately, my companion did not take a picture of the scary stairs up the side of the hill, so I can't show you how brave I was. We were in Varna, and yes, it's spelled that way in Cyrillic, Tuesday and Wednesday. Here are some pictures from Tuesday. 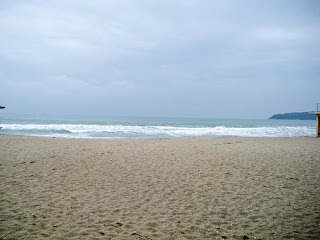 It was chilly and cloudy, so, since it's a seaside resort, it wasn't as happy a place to be as I'm sure it is in the summer. This first picture is of the McDonald's. 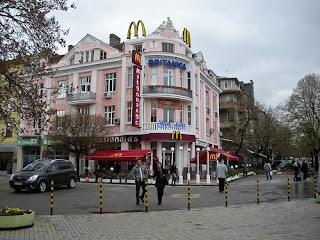 Every major Bulgarian city has at least two, I've observed. 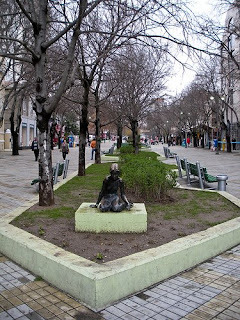 Like Sofia, Varna has a lot of public sculpture. This piece is on the sea side of a large public walkway. You can see the nice way the road is laid out. 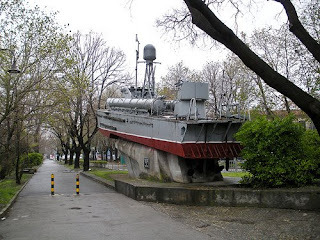 This is the bravest ship in the Bulgarian navy - it actually won a battle. In 1912. They are very proud of it. 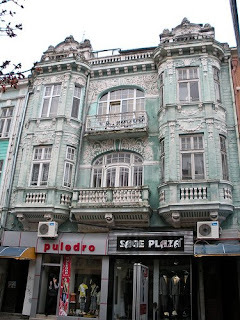 A lot of Varna's architecture is definitely mid to late nineteenth-century, like this building. I just liked the look of it. Here's a picture of the sea from the rather pathetic public beach. There's more beach that looks better up and down the coast, but the public bathing area's building has just been really neglected. It needs help. You can see how gray the sky is and how rough the sea is. Here's another shot of the public walking areas. This is a plaza about a quarter mile from the picture of the sculpture. One thing about all the towns we visited is that there is a shopping district that's walled off to traffic. It's nice to just stroll down the avenue.